WASHINGTON (CNS) — The declaration signed by Pope Francis and Sheik Ahmad el-Tayeb, the grand imam of al-Azhar, during the pope’s trip to the United Arab Emirates “is a clarion call for robust dialogue that leads to peace,” said the Catholic chairman of the National Catholic-Muslim Dialogue and the chairman of the U.S. bishops’ Committee on Ecumenical and Interreligious Affairs. “In our increasingly hostile world in which violence too often predominates between Christians and Muslims — violence that has led to tragic consequences for the most vulnerable humans — we welcome with great joy this historic joint statement on human fraternity,” said Cardinal Blase J. Cupich of Chicago and Bishop Joseph C. Bambera of Scranton, Pennsylvania. 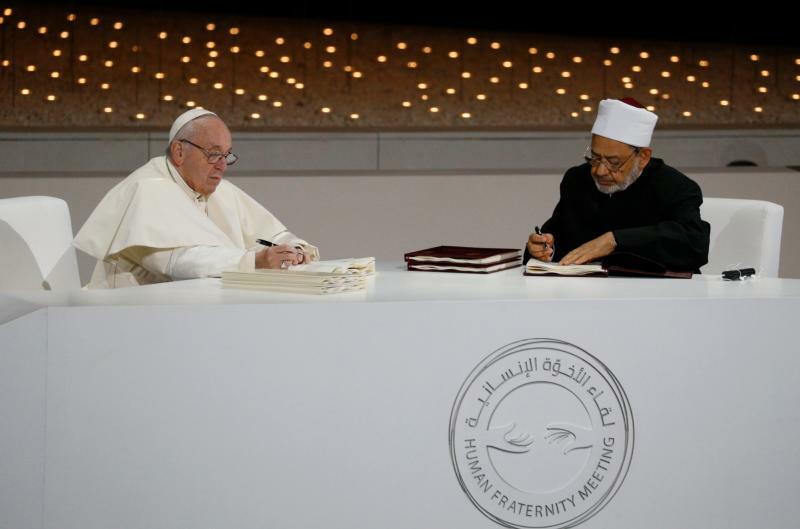 Pope Francis and Sheik el-Tayeb, a leading religious authority for many Sunni Muslims around the world, signed “A Document on Human Fraternity for World Peace and Living Together” Feb. 4 in Abu Dhabi. “We, who believe in God and in the final meeting with him and his judgment, on the basis of our religious and moral responsibility, and through this document, call upon ourselves, upon the leaders of the world as well as the architects of international policy and world economy, to work strenuously to spread the culture of tolerance and of living together in peace,” the document said. But the centerpiece of the declaration was a call on Christians and Muslims to recognize and respect one another and work together for the good of humanity.